You may think that vacuum cleaning your carpets may be sufficient for the removable of dust and dirt, but that is not the case. Dirt finds a way to remain within the carpet fibres and that stubborn grime requires a much stronger cleaner to extract it. 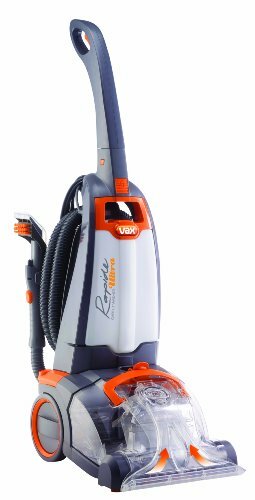 The solution to your problem may be the Vax W90-RU-B Rapide Ultra Upright Carpet Washer, a deep cleaning carpet washer which uses technology to bring cleanliness into your home. It is great for busy houses with kids or pets, and it also allows you to clean places other carpet cleaners can't, like sofas. The Vax Rapide Ultra comes with powerful rotating brush bars installed within it. These ensure that the dirt is extracted and eliminated from the carpets through a rigorous deep cleaning process. Carpets are able to attract dust and dirt easily which are not removed by normal vacuum cleaning or washes, so the presence of powerful rotating brush bars ensures that the carpets are smooth and clean. Their performance is superb, ensuring that the user does not have to exert physical force for better results. The carpet washer does its job in a most efficient manner. Vax went ahead to equip its Rapide Ultra Carpet Washer with their proprietary technology – the Dual V system, which ensures that your carpets are dry in no time. It serves as an effective drying system, ensuring that no water remains behind in the carpets. The fast drying time makes the carpet washer a great product as it does the job and wraps it up effectively in a small amount of time. Uses cyclonic and Dual V technology for powerful and effective cleaning. Comes with tools to make every place accessible to clean. Perfect for busy homes with pets and kids. Large capacity which ensures larger areas of your home are cleaned. Comes with a 1-year warranty and user manual. We generally had a good experience with this carpet washer. It effectively cleaned our carpets and it's a good option for homes with pets and kids. However, it is heavy and bulky, making it difficult to use and move around. The water tank can be difficult to clean out. It is impossible to disassemble it, making it difficult to remove any dirt or fluff that may be trapped inside. The Vax Rapide Ultra Carpet Washer is a great product for those looking for a strong and vigorous carpet wash which will remove most dirt and stains.